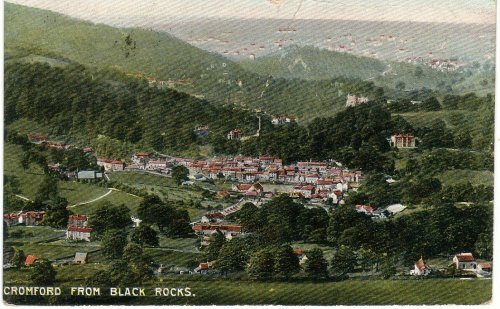 View from the High Point called "Black Rocks" looking due North onto Cromford village. The "Pond" (a dam) can be seen in the centre, surrounded by houses (see also X326). Beyond and to the right is Willersley Castle. Hidden in the trees are River Derwent, Arkwright's Mill and the Cromford Canal. This postcard was sent to Miss B(eaty) Brunt, 34 Boden St, Derby by "Carrie", posted 6 June 1909. 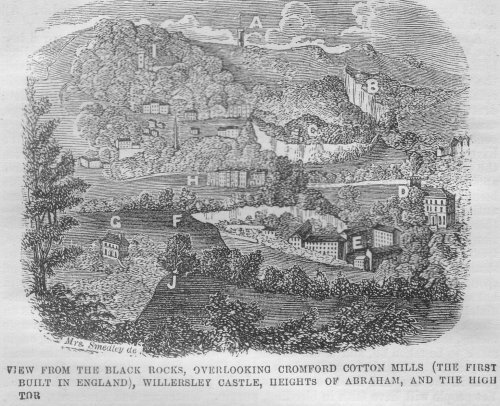 Close-up of Cromford from Black Rocks. 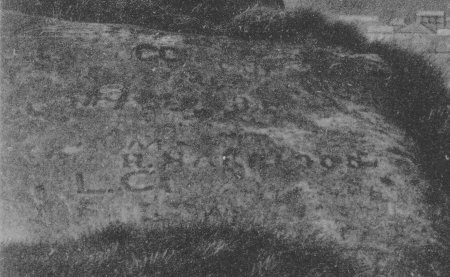 Initials carved on Black Rocks. Who are they?